“Founded in 1993, the University of Notre Dame Haiti Program (NDHP) seeks to achieve the historic goal of eliminating Lymphatic Filariasis (LF) in Haiti by 2020. In 2011 Let’s Share the Sun partnered with NDHP to install solar on the Residence Filariose in Leogane. “In 1954, a boy was arrested for stealing from the poor box of a small church in Cuernavaca, Morelos, Mexico. The young priest in charge, Father William Wasson of the United States, was unwilling to press charges against this "thief." Instead, he asked for custody of the boy. One week later, the judge sent him eight more homeless boys. By year's end, 32 boys were in residence and Nuestros Pequeños Hermanos™ (NPH), Spanish for "Our Little Brothers and Sisters," was born. Over 20,400 children have grown up in the NPH family, which now operates homes in eight additional countries: Honduras, Haiti, Nicaragua, Guatemala, El Salvador, the Dominican Republic, Peru and Bolivia. Today, over 3,300 children are being cared for in a loving, secure environment. Rev. Timothy R. Scully, C.S.C, and Rev. Sean McGraw, C.S.C., co-founded the Alliance for Catholic Education in 1993 to address the need for talented, faith filled teachers in Catholic schools. By forming a new generation of energetic and committed Catholic school teachers, ACE seeks to sustain and strengthen Catholic education, especially in under-resourced schools. In 2013 Let’s Share the Sun installed a 1.2 kW solar system at the Ecole Pere Perard school supported by ACE in Plasaince, Haiti. In the same year another 1.2 kW solar installation was completed at the Ecole Sainte Rose de Lima in the Saint Charles Morromeo Parish, in Borgne, Haiti, also an ACE supported school. Friends of Fontaine is a 501(c)3 tax-exempt organization dedicated to supporting community-based development in Fontaine, Haiti. The organization believes every child has a right to an education, and is striving to make that belief a reality in Fontaine. The organization’s goal is to provide high quality secondary education so students may confidently face the challenges of life in rural Haiti, and lead their community to a better future. The Xaverian Brothers have been supporters of the St. Gabriel School and Friends of Fontaine. 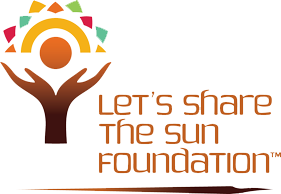 As such they have actively partnered with the Let’s Share the Sun Foundation around the solar installations at St. Gabriel’s School. St. Francis Xavier Haitian Orphanage is home to 18 children who were alone and living in desperate circumstances. Thanks to generous supporters, they now have food, clothing, shelter, education, medical care and adult guidance. The orphanage has come a long way since the journey began in 2011. The orphanage is committed to caring for the children as they journey from childhood to adulthood. To do that, the foundation has purchased land where a fully equipped Orphanage will be built not far from the site of the current rented property. This important next phase of the St. Francis Xavier Haitian Orphanage will ensure that the orphanage will be there for these 18 children, and other children in need, for many years to come. In 2013 the Let’s Share the Sun Foundation installed a 1.2 kW solar system at the St. Francis Xavier Orphanage. In 2015 batteries were replaced through a maintenance site visit. Boston College High School is a Jesuit, Catholic college preparatory school. The school strives to challenge students to become young men of integrity, educated in faith and for justice, committed to academic excellence and service to others. As a Jesuit, Catholic high school, the community strives to reflect the diversity of our church and community. Our mission since 1863 has been to form leaders of competence, conscience and compassion who seek to do all things for the greater glory of God. Soluz, Inc. is a business and technology development company commercializing distributed micro-power for the global transition to sustainable energy. The company’s core expertise is in the development and support of rural energy delivery companies—REDCOs—to meet the vast need for electric service in rural areas using a “wireless” approach to electrification. The mariposa dr foundation was founded in 2009 by a group of caring volunteers and children who were inspired by past works, and the urgent need for community-based solutions to end poverty. The mission is inspired by the united nations millennium development goals. These goals include eradicating extreme poverty and hunger, achieving universal primary education, promoting gender equality and empowering women, reducing the child mortality rate, improving maternal health, combating hiv/aids, malaria, and other diseases, ensuring environmental sustainability, and developing a global partnership for development. Achieving these goals is dependent upon the education and empowerment of women and young girls. In 2014 the let’s share the sun foundation made a contribution to the mariposa center for girls’ 10 kw to cover racking costs for the system. The St. Boniface Haiti Foundation (SBHF) strives to improve life for the poor of Haiti by facilitating access to quality, affordable health care, educational opportunities and community development programs. Our goal is to create a model of successful, sustainable development in rural Haiti that relies on local leadership and work force and that can be replicated throughout the country. We believe the only way to achieve this goal is by empowering Haitians to help Haitians. We work to improve health and quality of life for all members of the community at every stage of their lives. Founded in 1983, SBHF has grown into a recognized and award-winning leader in community-based care. Programs include our hospital in Fond-des-Blancs in southern Haiti, a satellite clinic in the village of Villa, a network of community health workers and mothers’ counselors, mobile clinics, nutrition programs, scholarships, community development programs, and Haiti’s first Spinal Cord Injury rehabilitation center. Nearly 200 employees (98% of whom are Haitian) serve more than 67,000 patients and thousands of community members every year. SBHF’s Fiscal Year 2015 will see the opening of our new Maternal Health Center in Fond-des-Blancs and the opening of improved, permanent facilities in Villa. This year also marks the eighth consecutive year Charity Navigator has awarded SBHF its coveted 4-star rating for sound fiscal management—a distinction only 1% of charities in the US can claim. Fully 89% of all contributions go directly to supporting our core programs in health, education and community development. Our mission is to combine the knowledge, skills, and experience of the Rensselaer community to engineer solutions to social, environmental, and economic problems, both domestic and foreign, in the most sustainable way possible. Our vision is a world of environmental, social, and economic prosperity created and sustained by local and global collective action.